People line up to vote on the last day of early voting at the Minneapolis Early Vote Center Monday, Nov. 5, 2018, in Minneapolis. Jim Mone | AP	(www.mprnews.org). With the 2018 election now firmly in the rear-view mirror and talk already turning to 2020 what better time to not talk about 2020 but instead talk about the 2018 elections that, as earlier stipulated, are now firmly in the rear-view mirror. Here then are a few random thoughts I’ve been thinking about the 2018 election. Yes, yes, by now everyone knows that turnout was high, a few fun facts about just how high that turnout was may be in order though. I haven’t looked back past 1994, but it’s almost certain that Jeff Johnson got the second most votes for Governor in Minnesota history, behind only Tim Walz. Turnout was so high that Jeff Johnson got the second most votes for Governor in Minnesota history while only getting 42% of the vote. That’s pretty high turnout. 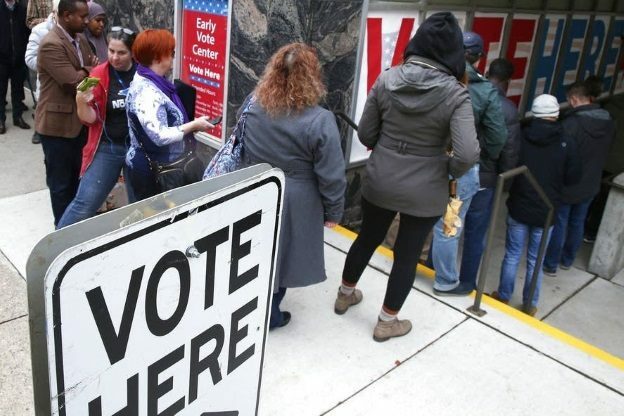 Minnesota’s third congressional district topped the country in turnout among congressional districts with two more Minnesota districts, the second and the fifth, in the top seven. Amy Klobuchar won re-election with over 60%. In 2012 she got 65%. In 2006 58%. You have to go all the way back to 1994 to find someone who got a higher share of the vote statewide than Amy Klobuchar did in her worst year. Tim Walz won the Governors race with 53.84% of the vote, the highest share of the vote anyone not named Amy Klobuchar has gotten since 2002 when Mike Hatch got 54.64% in the Attorney Generals race. Walz also won the race with an 11.41% margin of victory, the largest margin of victory in a Governors race since Arne Carlson demolished John Marty by almost 30 points in 1994. Going back to 2010 the DFL has won all 16 statewide races and of those 16 only three times did the Republican candidate even get within 2% of the DFL candidate, the 2014 Secretary of State race (1.17%), the 2010 Auditor race (1.26%) and of course the 2010 Governors race (0.42%). The forth closest race was for Secretary of State in 2010 (3.46%) and the fifth closest for Attorney General this year (3.88%). In fact, the DFL has been so dominant statewide that you have to go all the way back to the 1940s to find another time in Minnesota history when one party held every statewide elected office for as long as the DFL has now held every statewide elected office. From 1941 through 1948 the Republicans controlled every statewide office, with Hubert Humphrey ending the streak when he was elected Senator in 1948. To find the last time in Minnesota history that one party has held every statewide office for 10 years, which will be the situation in 2020 (that is of course, if you overlook the fact that the Lt. Governor has been a Republican for the last year), you have to go back to the 1800s. In terms of modern Minnesota politics the DFLs current statewide winning streak is unprecedented. The Independence Party of Minnesota first achieved major party status in 1994 when Dean Barkley surpassed the 5% threshold in his run for the Senate seat held by Rod Grams. They lost major party status in 2014 when none of their candidates were able to reach the 5% threshold, although Bob Helland came tantalizingly close in the Secretary of State race, getting 4.91%. This was the first election since the Independence Party gained major party status in which they did not compete as a major party. They tried to regain their major party status this year by running a candidate in just one statewide race, for Secretary of State, but again they fell short. While the Independence Party remains in the political wilderness, two(!) separate marijuana related parties were able to crest the 5% mark and acquire major party status, Grassroots – Legalize Cannabis (5.71% in Attorney General race) and Legal Marijuana Now (5.28% in Auditor race). It’s unclear how much staying power two separate weed parties will have, but a thing that is fairly clear is that in recent Minnesota history votes for third-party candidates have tended to come at the expense of DFLers more than Republicans. This can be illustrated in the following two graphs which show the correlation between 1) DFL and third-party vote share and 2) GOP and third-party vote share, in all of the constitutional officer races since 1994. 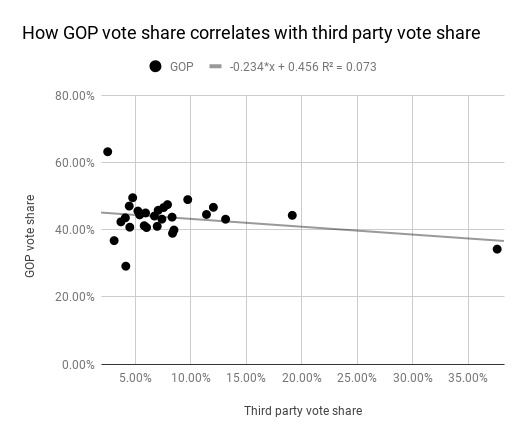 In both cases the slope is negative, meaning as the share of third-party votes increases the share of votes of the party in question decreases. 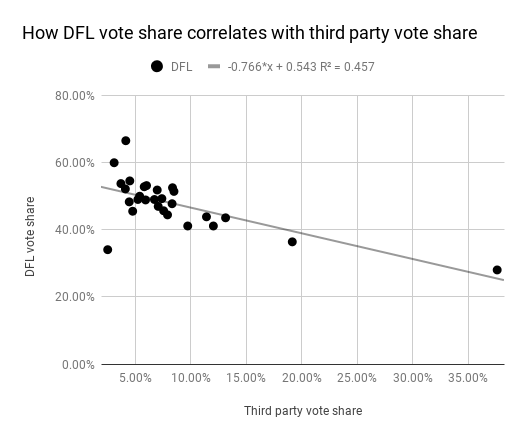 On the DFL graph the slope is quite a bit more pronounced, meaning that increases in third-party vote share have tended to have a greater negative impact on the DFL share of the vote than on the GOP share. The r-squared values also support the hypothesis that third-party votes have hurt the DFL more than the GOP, almost half of the variance in the DFLs vote share can be accounted for by the variance of the third-party vote whereas it explains only 7% of the variance in the GOPs vote share. The demise of the Independence Party is undoubtedly a good thing for the DFL, but just as they have rid themselves of one nuisance, two new ones have emerged to contend with. The difference in the dynamics between the parties may be important as well, in an attempt to occupy the political center the IP fielded candidates they felt could appeal to Republicans as well as Democrats. While the graphs above support the hypothesis that the primary source of IP votes were DFL leaning voters, that was not the only source of their votes and they undoubtedly drew some soft Republicans as well. It’s uncertain that will be the case with the two new major parties, that is if they even last beyond the next election cycle when they will have a single race, for the US Senate, in which to field candidates.